The hotel is 50 km/31miles of Antalya, Olympos can eather of two scenic byways, the snake can be reached through a beautiful nature, or from the sea can be achieved. The visit to the site a pleasant and refreshing walk through the ruins and along a creek near Olympos beach, where you should not miss the opportunity to enjoy a refreshing swim are scattered in the sea. This ancient city extends to the sea on the slopes of a narrow valley. On both banks of the river, where growing reeds and laurel trees, the following ruins are found: the necropolis situated on a hill, the agora and gymnasium, the Byzantine basilica, the theater, the baths, a bridge, a temple built in order to ionic during the reign of Marcus Aurelius, the bishop’s house, graves, one grave chamber with two coffins, and the acropolis on the hill. 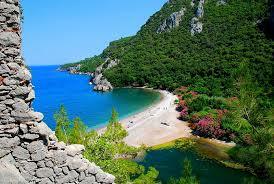 Olympus was in the 3rd Century BC founded and became one of the six major cities of the Lycian League. During the first Century BC was the place often visited by pirates. As this was in 78 BC by the Roman governor of Lycia, Olympos and surrounding area were struck together to become a Roman province. During the second Century AD, grew extremely wealthy Olympos. The Pirates, once more attracted by her wealth provokes continued its downward slide. Later, the Venetian and Genoese pirates, the city was finally abandoned when the Ottoman fleet chased the pirates. During the Roman era Olympos was quite famous with the cult of Hephaestus at the Çıralı whorshipped was higher in the mountain. At this point there is a natural phenomenon of sulfur fumes, which was recorded for at least 4000 years. You can delete the small fires, but the gas inside the mountain it is light again in a few minutes. The flames arose the legend of the Chimaera, the daughter of Echidna and Typhoon, which saw a three-headed creature with the front part that looks like a lion, the middle part looked like a goat and the tail was like a dragoon. Because of the uncertain love affair in which he was involved and as punition, was gallantly sent Bellerophon, spat by the king of Lycia, the chimera, the fire and terrorized the region to kill. Favored by Athena, Bellerophon caught mounted Pegasus, the winged horse and attacked the Chimaera from above. He drove the leadership of his spear into the mouth of the monster, where the lead is melted and strangled the animal. Sun Bellorophon she went back into the earth, where she still spits fire, and for this reason, you can see small fires from the hole in the upper reaches of Cirali Olympos! Near Tekirova, a forest road leads to the ruins of Phaselis, scattered on a peninsula surrounded by three natural harbors and sandy beaches. This ancient city, located at the border of Lycia and Pamphilya, was founded by colonists from Rhodes Island in 690 BC. Overrun by the Persians, in the 5C BC Phaselis freed and later even became independent from Lycia, forming an alliance with Mausolus, the satrap of Caria, in the 4C BC. Phaselis was the most important port city in the region until the foundation of Attalaia (Antalya) in the 2C BC. The inhabitants minted coins showing the bow of a ship on one side and the stern on the other. In the winter of 333-334 BC, during his campain against the Persians, Alexander the Great spent some time in Phaselis, whose population had submited at once to his authority, before he advanced to Central Anatolia. After Alexander’s death, the city remained in the Ptolemies’ hands from 209 till 197 BC, then in the Seleucids’ hands before it was handed over in 190 BC to the Kingdom of Rhodes together with the other cities of Lycia. From 167 BC, Phaselis became part of the Lycian League under Roman rule. But in the 1C BC, like Olympos, Phaselis was under the constant threat of the Cilician pirates who even took the place for a period and set it on fire when they were defeated by Rome to which the city was linked in 42 BC. In the 2C AD, for the purpose of Emperor Hadrian’s visit, Phaselis was adorned with new statues, monuments and buildings, and most of the remains which can be seen today, date back from this period. In the Byzantine times, the city became a bishopric. Suffering again from pirates and Arab raids, the harbours began to lose importance and the city fell in complete decay. In the 12th century, when the Seljuks settled in the region, they prefered to concentrate in Alanya and Antalya, and Phaselis fell into oblivion. Phaselis was home to the tragic author and poet Theodectes who was the pupil of Socrates and Aristotles. The Bath which was part of the bath-gymnasium complex. Hadrian’s Agora, almost square-shaped, lies south of the bath and was lined by porticoes and shops. The side of the agora looking onto the main street was decorated with statues and a fountain. Domitian’s Agora lies along the second section of the main street. An inscription written in honor of the emperor was found above one of the two gates that faced the street. At the far end is a late period agora connected with the south harbour. The Monumental Gate of Hadrian bears an inscription in honor of this emperor. Located at the end of the main street, the gate opens onto a beautiful sea and mountain scenery. The Bath (late period 3-4th century) whose brick foundations which provided heat, can still be seen. A little further, lining the main street, are the Public Toilet which were covered with mosaics. The Roman Theatre, located above the bath, replaced an earlier Hellenistic theatre and had a seating capacity of 1,500 – 2,000 spectators. It overlooks the city and the sea. The Acropolis, covered with a thick vegetation, is located above the theatre. According to ancient writers, here stood the Temple of Athena where Achilles’ broken spear was exhibited, and which is said to be the first place Alexander the Great visited upon his arrival in the city. However the temple has not been yet localized. Other temples, a palace and official buildings were also built on this site.